Considering that babies spend a great deal of time in their cribs, it's important to take your time choosing the right model. Spending a few minutes to review these crib buying tips will help you choose the ideal slumber spot for your little one. What are the major safety features to look for in a crib? Baby's safety is your top priority when it comes to choosing a crib. Look for the following features when deciding on the ideal model. Slats no more than 2 3/8 inches apart With slats that are any wider, baby runs the risk of having his torso fall through and trapping his head, which can have fatal consequences. Corner posts no higher than 1/16 of an inch, unless they support a canopy. Corner posts higher than 1/16 of an inch can potentially catch baby's clothing and cause injury or choking. Stationary sides Though drop-down sides that made leaning over to pick up or put down baby unnecessary were once quite common, accidents involving the movable railings caused the Consumer Product Safety Commission to ban their manufacture and sale as of June 2011. Lack of cutout designs along railing and finials on the corners Though they may add a decorative touch, cutout designs attached to the crib railing pose a choking hazard risk, and finials can cause children's clothing to catch, leading to strangulation. Adjustable mattress height As baby grows, in order to ensure his safety, you must be able to lower the mattress so that he doesn't run the risk of climbing out and falling. Stability A stable, well-constructed crib is a necessity. 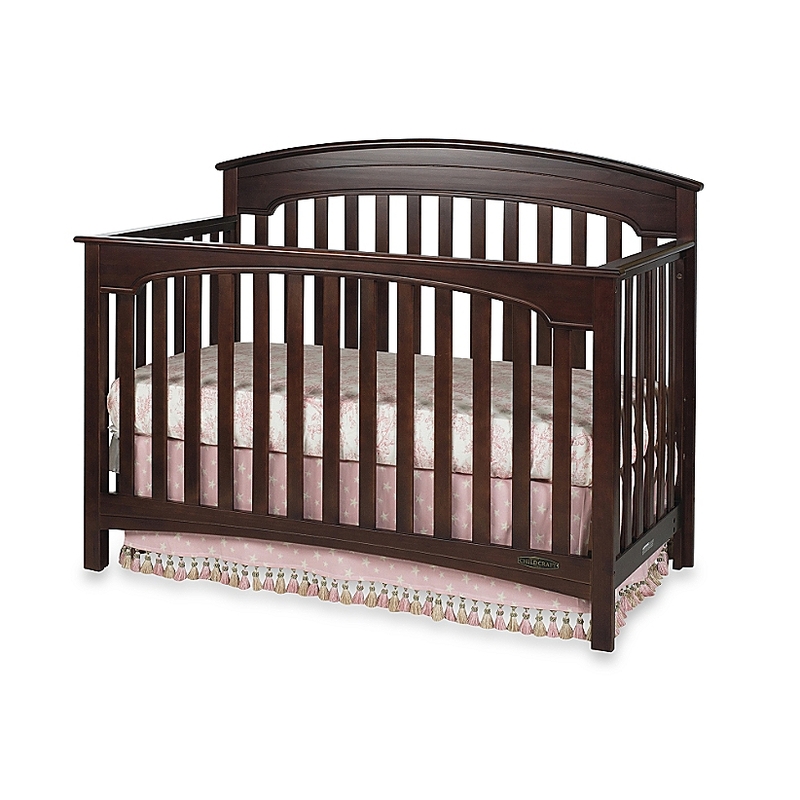 High-quality cribs possess one or more stabilizer bars, which are metal rods fastened to each end board beneath the crib. Test a crib for stability by shaking it. It should not rattle, but seem solid. If the crib is wood, there should be no signs of warping, splitting or splintering. Frame size at least 51 3/4 inches long by 27 3/4 inches wide. The correct frame size is critical to a tight-fitting mattress. If you can fit two or more fingers between the mattress and the side of the crib, the mattress is too small and your baby is in danger of injury. As an extra precaution, check that the crib is certified by the Juvenile Products Manufacturing Association, which ensures that the crib model you are considering has passed safety tests. Are there other crib options besides a standard crib? A convertible crib is perfect if you are looking for a longer lasting option, a mini crib is ideal if the baby's nursery has limited room, and a portable crib is good for short stays at grandma's house. comes in 3-in-1 combination (crib, toddler bed, twin bed size) or a 4-in-1 combination (crib, toddler bed, day bed, full size bed). Some convertible cribs convert to a toddler bed without a conversion kit, while others require a separately purchased conversion kit. Also check to see if the model has a toddler guard rail and/or a side rail or if you will need to buy each separately. is great for apartment dwellers or a smaller room. Most will convert to a twin size bed, but the conversion rails are a separate purchase. is meant for short stays or infrequent use. They are lightweight and easy to use, and have a lower baby weight limit (around 30 lbs.) than standard or convertible cribs. Is it possible to continue to use the crib as your child grows? If you purchase a convertible style crib, you can make the most of your investment by using the crib for the next several years. Some cribs grow with your child, converting into toddler beds and then transforming into full-sized beds or daybeds. Convertible beds often require that you buy extra components to make the conversions, such as bed-rails. How likely are you to find a crib to match your decorating scheme? Baby cribs come in a wide variety of styles, finishes, designs and even shapes, giving you plenty of decorating options. Cribs feature various colors, including white, French white, gray and many shades of brown and are constructed of a variety of attractive woods, including poplar. Some cribs are ornate, while others feature simple, clean lines. Many cribs are rectangular in shape, but there are some on the market that are oval and even round. Some cribs also come with matching changing tables. All full size cribs include an adjustable mattress support with either three or four levels. This is important for it allows a parent to lower the mattress as your baby grows. Supports are typically metal springs, wooden platforms or wood slats. The highest setting is for newborns. Once baby starts to roll over and sit up, the support should be moved to a lower setting. The middle setting is used until baby starts to pull himself up. At the lowest setting, the crib rail must be a minimum of 26 inches from top of the mattress when rail is raised, and a minimum of 9 inches when lowered. It is advisable to remove casters to keep the crib more stable as a child becomes bigger and more active. Note - portable cribs typically have two mattress support heights. Caster wheels allow you to easily move the crib in order to clean underneath. A storage drawer is usually available with standard cribs. A drawer is great for storing extra bedding, clothes or shoes. Though they are typically sold separately from the crib, it's best to buy the mattress at the same time so that you can ensure that it fits correctly. A mattress to be used in a full-sized crib should be at least 27 1/4 inches wide by 51 5/8 inches long and no more than 6 inches thick. To reduce the risk of injury, only a tight-fitting crib sheet should be used. *Dust ruffles hang from underneath the mattress and give a finishing touch to the crib. They also camouflage anything you have stored under the bed. When your little one transition's into a toddler bed guard rails may help reduce the risk of falling. *Fabric or plastic teething rail. This item will help to protect your child, as well as the crib while your child is teething.